when he visited for The Early Show's "Tour My Town" series. Sharon Earhart asked The Early Show to come to her hometown when she wrote, "I am thrilled to invite you to 'Tour Our Town' of Powell, located in northwestern Wyoming, 75 miles from Yellowstone National Park and 20 miles from the Montana border. Our former governor once said, 'Wyoming was a state of low multitudes, high altitudes and great attitudes, and that is exactly what best describes Powell." Price says Powell "has taken charge of its future, refusing to go the way of so many small towns in America. They redefined the term 'ownership' when the retail store that was the anchor, the heart of their main street, went out of business." Resident Judy Buckingham told Price, "I think it was immensely important that we fill (the spot) instead of having an empty storefront, 'cause it just looks like you're a dying town." Although there wasn't much wealth in Powell, Price points out there was the heart and determination to develop a business plan, and sell shares at $500 each. Terry Faxon put together enough money to buy one share. Faxon explains, "I want to give back something to the community that gives back to us, you know? Make something happen here." "You couldn't by a white shirt in Powell, Wyoming," when the old store went belly-up, says Ken Witzeling, who was chairman of the board that raised $400,000, enough to reopen the store, the Powell Mercantile, or simply "The Merc" for short. "People come in and they say, 'This is our store,' " Witzeling says. "They have people come to visit, something like that, or the kids come back, and say, 'Come on, we've got to go down and show you our store.' That's proud ownership." What's more, The Merc is in the black. , it forced Adam to change his mind about leaving the small town for someplace bigger.
. One World War II vet got so emotional discussing classmates he lost who are remembered in the monument, he cried openly. Forrest "Frosty" Cordes is the star salesman of the Merc. He's 80-years-young. "I'm among friends," he says. "I'm getting money from my friends!" He and Price both laughed at that thought. "Can't beat that!" Price exclaimed. "When you walk into (the Merc), what kind of experience do you have?" Price asked Buckingham. "Oh, it's wonderful," she replied. "And they help." "You're smiling just talking about what many would consider a retail store," Price remarked. "Yeah, but you know, we own it. It, it's ours," Buckingham explained. 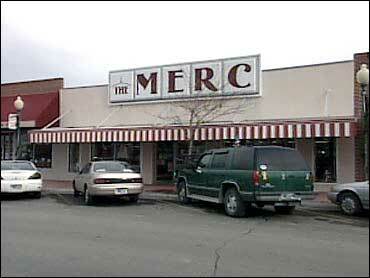 "When you drive by (the Merc), and you look at people shopping, what pops through your mind?" Price asked Witzeling. His very emotional response, after pausing quite awhile to collect himself: "Oh, I think, uh, it's a feeling of satisfaction that we've done a good job." "What's the next generation learning from what's taken place in this town?" Price inquired of Earhart. "Oh," she answered, "I think they're learning that you take care of your own problems." When the people of Powell saved their store, Price observes, they saved themselves, too. "Don't expect corporate America to take care of you," Earhart continued. "Don't expect the government to take care of you. …People know that, if they want to get something done, you do it yourself. And you have better solutions that way. …That's the thing with leaving your ego at the door." Is that a small town thing, Price wanted to know. "Well," Earhart said, "it doesn't have to be. It could be everywhere."